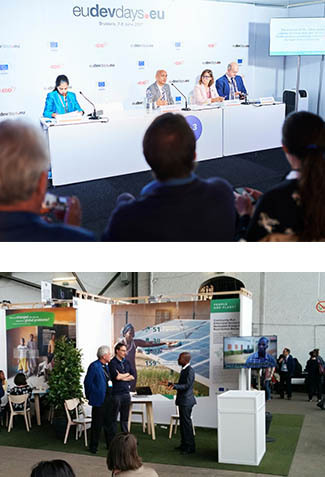 Humana People to People is excited to announce its involvement in this year’s European Development Days (EDD), to be held in Brussels on the 5th and 6th of June this year. 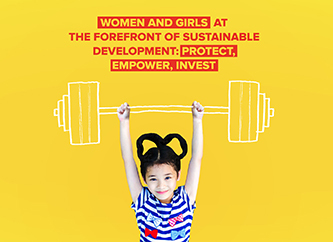 This year’s theme for Europe’s largest event dedicated to international cooperation, development and humanitarian aid is Women and Girls at the Forefront of Sustainable Development: protect, empower, invest. During the two-day event, Humana and its members will share in-depth learnings on gender mainstreaming in teacher training activities and experiences on moving towards gender equality in education. Conceição da Glòria Sozinho, Director of ADPP Teacher Training College in Chimoio, Mozambique, will be sharing her own insights in a lab debate hosted by the International Task Force on Teachers for Education 2030. The debate, titled Female Teachers and Gender Equality in Education will be held at 9:00am on the 6th of June in debate room D1. She will be joined by H.E. Paul Mavima, Minister of Primary and Secondary Education in Zimbabwe; H.E. Marie Odile Attanasso, Minister of Higher Education and Scientific Research in Benin; and Mrs Teopista Birungi Mayanja, Regional Coordinator for the Africa Network Campaign for Education for All (ANCEFA). The Debate will be moderated by Dennis Sinyolo, Senior Coordinator of Education International. Girls are still 1.5 times more likely than boys to be excluded from primary school, and half of out-of-school primary-aged girls are unlikely to ever enter school. Wealth disparities and the rural-urban divide further exacerbate barriers and vulnerabilities faced by girls, which increase as they get older. Female teachers have an important role in addressing access and quality issues in girls’ educational experiences – especially in places where women are discriminated against and under-represented in political, employment, and leadership positions. Interestingly, the gross enrolment ration in secondary education is often used to monitor trends and progress from primary to secondary level. The data reveal that the percentage of female teachers in primary education roughly correlates with girls’ GERs in secondary education. Although women make up the majority of the teaching profession in many countries, a closer examination can reveal significant disparities, particularly in rural and hard-to-reach areas. They can be harder to recruit in these areas due to socio-cultural barriers and safety issues. In addition, despite representing a majority of teachers at both primary and secondary levels, female teachers are not as likely as their male counterparts to move into school-level management positions. This session will explore policy, funding and civil society best practices in empowering women to enter and remain in the teaching profession and their role in providing a gender-responsive education to all children. 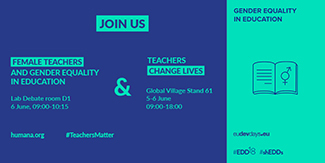 Global VillageIn addition, Humana will be hosting stand 61 in the Global Village to highlight its approach to gender mainstreaming in teacher training. Titled Teachers Change Lives, the stand will feature lessons learned and experiences from the seven countries where partners manage Teacher Training Colleges.